Now that AT&T customers are finally getting their chance in experiencing webOS in the flesh with the recently launched Palm Pre Plus, it looks like the fun will be even more in the coming weeks. We've reported a week back that the Palm Pixi Plus was going to show up its face some time on June 6th alongside the LG Vu Plus – but now it's quite clear that AT&T intends on launching it on that date. Just checking out AT&T's web site right now, it shows the Palm Pixi Plus sitting next to its older brother, but there is still no official word surround pricing – it's actually rumored to become available for $49.99 on-contract after mail-in-rebates. Sporting a somewhat more attractive price point than the Palm Pre Plus, it still pales in comparison to Verizon's offering – but you never know what AT&T can do between now and then. So if a slimmer webOS handset is faintly echoing in your future, it would probably be wise to wait out until then – that's unless you prefer the higher end specs of the Palm Pre Plus. 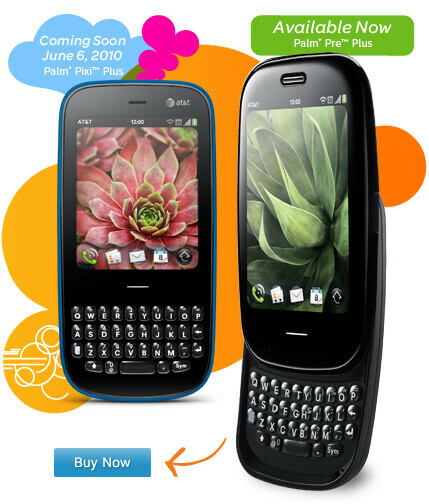 The Palm phones are doing well with no carrier - the company completely failed with its marketing campaign. It will sell a little better with AT&T's customer base and the phones will appeal to the female populace.